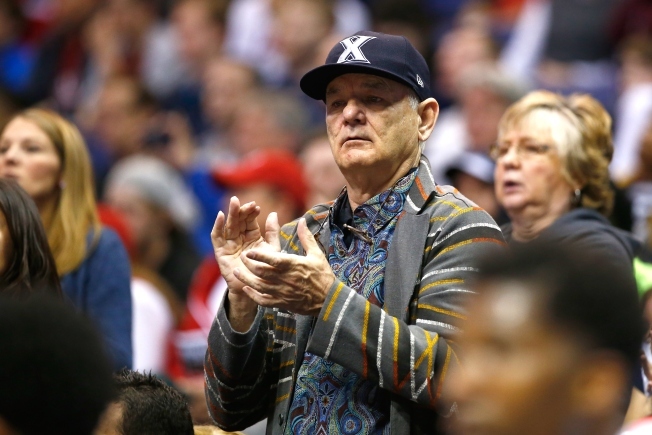 If anyone perfectly summed up the emotion felt by Xavier fans after the team’s shocking March Madness loss over the weekend it was Bill Murray. Murray, whose son Luke Murray is an assistant coach for Xavier, was caught on camera after the No.2-seeded Musketeers lost to the No.7-seeded Wisconsin Badgers Sunday night and his reaction took over the Internet. The moment was captured just after Wisconsin’s Bronson Koenig made a remarkable buzzer-beating shot that lifted the Badgers to victory in the final seconds of the game. Murray is known for being a passionate sports fan (for those of you that forgot his memorable Chicago Cubs fandom, here’s a reminder), but it was his lack of emotion at the end of the game that had many taking notice. When his team lost, the Groundhog Day star appeared shocked and emotionless staring at the court. The reaction almost immediately sparked memes and social media comments. Meanwhile, NBA rookie Frank Kaminsky took things in the opposite direction. Video of the Charlotte Hornets player and former Badger reacting to the win showed him screaming with excitement before running onto tiled floor and sliding across it. No matter where your allegiance lies, the March Madness is bound to continue.